- ... but before you visit them, skim the west side of the beach. Beside a small tent and some fishing nets is a chest containing two Antidotes. If you give the east side of the beach a similar treatment, you'll find a chest containing a Moon Crest in a small inlet. - Approach the group of guys. Cut scene ensues. Say hello to Wakka. Follow him when he takes off. After the next cut scene, use the Save Sphere and continue up the beach inland. - Approach the water. Boot! - Swim your way to the east. There are Pirahna in these waters, and you can use them to test out Wakka. These Pirahna are also decent for collecting Spheres, though you won't have to worry about running out of these too much during your journey. - Eventually you'll wind up back on land. The red waypoint marker on your map will point you west; pay heed. You'll go east soon enough. -Welcome to the quaintest community on the world map. Time to explore! We'll begin on the left side of the village. - Outside the first tent is a chest containing a Phoenix Down. Inside is a quaint Item Shop which you probably won't need to use. - Between this tent and the next one to the north is a path to the east. The house within is trashed; inside its remains are three chests. They contain two Potions, 400 gil, and a Hi-Potion. - The next tent to the north contains the Crusader Lodge. Chat with Luzzu and Gatta for some more info on the world, speak to the woman behind the desk to take a nap, and check the rear for a Save Sphere. Beside the woman at the desk is the Al Bhed Primer Vol. II. - Now for the east side of the street. Check out the tents... and you'll discover that they're preeeetty much useless. Oh well. - With naught left to do, enter the temple in the north and watch the cut scene. Approach the statues inside the temple for yet further cut scenes. - Leave the temple after looking around and head to Wakka's home (middle tent on the right side of the village). Take up his offer to have a nap. - Return to the temple after the cut scene. Speak to Wakka and Tidus will act extremely impulsive. The Cloister of Trials in Final Fantasy X constitute the bulk of the game's puzzles. You must complete a series of tasks, often in order, to complete each trial. Consequently, you may want to complete the following steps in precise order. 1.) Approach the glowing glyph on the far wall in the first room and investigate it. 2.) Touch the glyph on the wall to the right of the first glyph. 3.) Descend the stairs. Halfway down, remove the Glyph Sphere from its recess in the wall. Descend further. 4.) Use the Glyph Sphere on the door at the bottom. 5.) Remove the Glyph Sphere from the door. It won't close, so no worries. 6.) Follow the twisting passage past the first turn. To your left is a small recess in the wall. Insert the Glyph Sphere to open a secret passage; inside is a Destruction Sphere. Leave it here for now. 7.) Take the next turn. Across from a small pedestal where you can set a sphere is a series of arcane writings on the inside wall. Examine them to open up a secret room; inside is a Besaid Sphere. 8.) Use the Besaid Sphere on the pedestal immediately outside the secret room to open up a new passage. 9.) Run back and grab the Destruction Sphere. Set it in the recess where you found the Besaid Sphere. This will trigger a wall to vanish at the end of the hallway. Inside is a chest containing a Rod of Wisdom. 10.) Move to the pedestal containing the Besaid Sphere. Move it forward into the unveiled chamber until it triggers a cut scene. - Once the Cloister is done for, follow everyone outside to trigger a long set of cut scenes. One of your new companions, Yuna, will receive the Valefor Aeon. Woo! 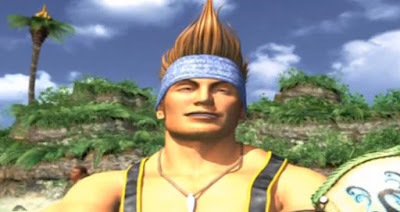 - Talk to Wakka once all is done to snooze the night away. More cut scenes! - Leave the Crusaders Lodge after waking up. Wakka will give Tidus the Brotherhood weapon, which, quite frankly, is a good enough sword for the remainder of the game (so long as you keep upgrading it, that is). - Time to go. Head east along the path. You'll receive a few tutorials regarding Wakka, Lulu, and Yuna, and switching between characters in battle. Mind this, as only characters who participate in a battle receive AP at the end. Tidus will also have to fight Kimahri, another party member, though the fight isn't too tough - just mind his Jump attack, which can do around 100 HP worth of damage. - Eventually you'll wind up on the beach. Follow everyone to the boat on the pier. Before boarding, talk to the assembled crowd for a cumulative Ether, 400 gil, Seeker's Ring, Remedy, and three Phoenix Downs. You'll have to talk to the characters multiple times to get them all. Farewell to Besaid! Off we go!